Vancouver, B.Câ€�â€�..Corvus Gold Inc. (“Corvus” or the “Company”) - (TSX: KOR, OTCQX: CORVF) is pleased to announce the beginning of its aggressive 2013 North Area (Figure 1) exploration program at the North Bullfrog Project in Nevada. Â Exploration will focus on three main initiatives: 1) Expansion of recently discovered high-grade gold and silver vein type mineralization within the Yellow Jacket zone and other associate structural zones; 2) Expansion of a recently discovered higher grade, bulk tonnage zone north of the Sierra Blanca deposit which has potential for an early higher grade starter pit; and 3) The overall North Area infill and step out resource expansion program which, together with the results from the 2012 exploration program, will be used in an updated resource estimate scheduled for later this year. In addition to the exploration drill program, ten water monitoring wells will be drilled in the North Area to begin groundwater characterisation studies. The 2013 drill program is scheduled to complete approximately 20,000 metres and utilize three drill rigs. Following the discovery of the Yellow Jacket high-grade gold and silver mineralization in 2012, which included an intercept of 2.1m @ 33 g/t gold and 2,870 g/t silver contained within 72.4m of 1.7 g/t gold and 98.7 g/t silver (Table 1), a program of surface mapping and 3D geophysics was carried out to arrive at a better understanding of the structural controls on the mineralization. Â The result of that work has defined at least two steeply dipping structural zones that host high-grade vein type gold and silver mineralization (Figure 1). 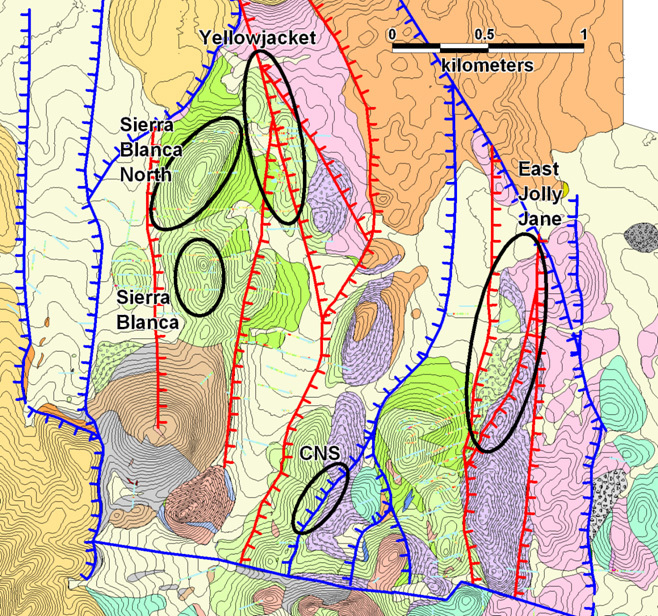 Â At the Yellow Jacket target, a broad structural zone has developed that appears favourable for both vein type and disseminated mineralization and has now been intersected in drilling over a strike length of 700 metres. Â As a result, Yellow Jacket has emerged as a priority target with potential to host a significant deposit over some two plus kilometres of potential extent. At East Jolly Jane, a target was developed through new surface mapping and drilling earlier this year which defined intense silica-adularia alteration between several faults in the area (Figure 1). Â This unique and distinctive alteration is analogous to areas in the Yellow Jacket target where the zones between faults are mineralized rather than the faults themselves.Â At Yellow Jacket these broader zones provide vectors toward areas with high-grade vein potential.Â The CNS target is another similar Yellow Jacket type structural target which has never been tested and will be addressed in the 2013 program (Figure 1). 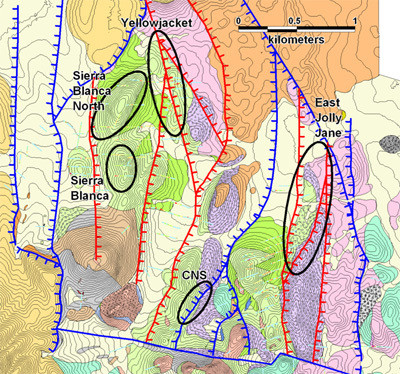 Â It is anticipated that other targets will be developed as drilling continues to improve the geological understanding of high-grade vein mineralization in the overall North Area gold-silver system.Â The high grade silver component of these target zones is an added bonus as previous economic assessments did not include any silver component. Drilling during early 2012 indicated an open ended zone of distinctly higher grade disseminated gold mineralization, starting at or near the surface, located outside of the current Sierra Blanca and North Sierra Blanca deposits.Â Previously returned drill results include a step out hole 400 metres west of the current boundary of the Sierra Blanca resource (Hole NB-12-117) that intercepted 52 metres of 0.8 g/t gold, including 15.3 metres of 2.36 g/t gold, and a step out hole 250 metres north of the Sierra Blanca resource that intercepted 46 metres of 0.56 g/t gold (Hole NB-12-118).Â These results and additional step-out holes completed in 2012 were not incorporated into the Preliminary Economic Assessment published in late 2012.Â The extent of the mineralization boundaries is unknown and will be addressed in 2013, together with infill drilling to address large areas of unestimated resource blocks and to upgrade the confidence of the existing resource estimate. The delineation of this higher grade mineralization has potential to not only add substantial ounces to the resource base but also to significantly enhance the current North Area mine plan, and will therefore be a priority of the 2013 RC drill program. *Intercepts are approximate true width and calculated with 0.2 g/t cut-off and up to 0.7 m of internal waste. Ten water monitoring wells will be drilled around the North Area resource area to begin acquiring baseline data for future permitting. Â This will expand the current water quality monitoring program and aid in future permitting efforts. Figure 1: Geological map of the North Area of the North Bullfrog Project indicating initial high-grade targets to be tested with the 2013 exploration program. Â Blue faults are the west-dipping normal faults and red faults are a set of newly recognized steeply east dipping structures that appear to be intimately related to the development of both fault hosted and disseminated mineralization. This press release contains forward-looking statements and forward-looking information (collectively, “forward-looking statements”) within the meaning of applicable Canadian and US securities legislation.Â All statements, other than statements of historical fact, included herein including, without limitation, statements regarding the anticipated content, commencement, timing and cost of exploration programs, anticipated exploration program results, the discovery and delineation of mineral deposits/resources/reserves, the potential to increase the current estimated resources, the potential for any mining or production at North Bullfrog, the potential to expand the high grade gold and silver at the Yellow Jacket target; the potential to expand the higher grade bulk tonnage at the Sierra Blanca target, the potential for any delineation of higher grade mineralization and any consequent potential of such mineralization to not only add substantial ounces to the resource base but also to significantly enhance the current North Area mine plan, the potential for any higher grade portions of the deposit to be a potential starter pit, the potential to add to existing resources or to increase the confidence in the existing resource estimate, the potential for there to be a low strip ratio in connection with any mine at North Bullfrog, the potential for the existence or location of additional high-grade veins or higher grade mineralization, the potential for taking any silver resource into consideration to improve the economics as outlined in the December 2012 PEA, the potential for the Company to secure or receive any royalties in the future, business and financing plans and business trends, are forward-looking statements.Â Although the Company believes that such statements are reasonable, it can give no assurance that such expectations will prove to be correct.Â Forward-looking statements are typically identified by words such as: believe, expect, anticipate, intend, estimate, postulate and similar expressions, or are those, which, by their nature, refer to future events.Â The Company cautions investors that any forward-looking statements by the Company are not guarantees of future results or performance, and that actual results may differ materially from those in forward looking statements as a result of various factors, including, but not limited to, variations in the nature, quality and quantity of any mineral deposits that may be located, variations in the market price of any mineral products the Company may produce or plan to produce, the Company's inability to obtain any necessary permits, consents or authorizations required for its activities, the Company's inability to produce minerals from its properties successfully or profitably, to continue its projected growth, to raise the necessary capital or to be fully able to implement its business strategies, and other risks and uncertainties disclosed in the Company’s latest interim Management Discussion and Analysis and filed with certain securities commissions in Canada.Â All of the Company’s Canadian public disclosure filings may be accessed via www.sedar.com and readers are urged to review these materials, including the technical reports filed with respect to the Company’s mineral properties.